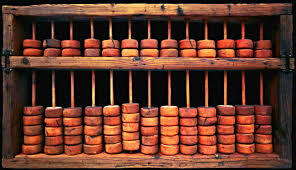 I need an abacus with coloured beads like those we used to have when we were little, as my fingers and memory are not enough for all these numbers that go to sleep and wake up with me to accompany me all the time, like a shadow of disappointment. I need an abacus with coloured beads to count every day. -Forty three years of disappointment and loss have passed with all their weight, like a bulldozer, over our faces, our lives and our memory. -Eight stray bullets, a mortar shell and an unidentified corpse like a gratuitous ad for the beginning of a new night in the alleys of our neighbourhood, teeming with fear and strange faces. -Seven naked heavens stretching lazily and with unmatched coyness in full view of the crowds lined up begging for a loving look. -Five recent wrinkles growing on my face which I spread, enraged, like a peddler of used clothing, for the passersby to rummage through, while none of them thinks of buying it even as a mop. -Three nightmares that cling to my fever-ridden body, like a lover who has fled her marital home which is as boring as this country. -Twenty disappointments and a disappointment for the faces of departed friends whose names and phone numbers still nibble on my heart and memory like the locust. -Four white clouds hastening to land like sparrows, and peck at the black woollen scarf on the laundry line in my mother’s garden. -Two dimples and nine moles on her face, more appetizing than a loaf of bread, one birth mark, shaped like an almond, near her navel, ten fingers and two burning lips, slumbering on the edge of the pavements of fatigue. Wonderful. Had never heard of Fawaz Azem. And what a great poem. Thank you MLQ for bringing all these treasures to us. Maybe he will give reading somewhere in NYC?